"Look deep into Nature, and then you will understand everything better.” In eleven simple words Albert Einstein issues an irresistible invitation, reveals a sweeping truth, and gives us a profound way to comprehend fundamental aspects of ourselves and our world. To look deeply is to grasp more fully. To observe and experience Nature this way is to better understand all that is. Nature is the supreme purveyor of understanding if we will but observe its lessons and recognize its truths. From Nature we draw the life-sustaining air that we breathe, obtain our water and food and everything essential to our survival and well-being. 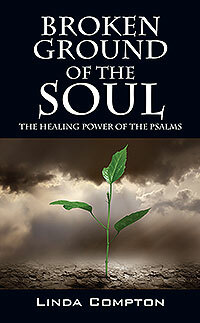 Through the Laws of Nature, our Creator also provides the possibility of endless inspiration and regenerative growth. 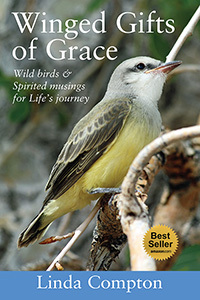 Winged Gifts of Grace: Wild birds & Spirited musings for Life’s journey, is a book of color photographs, accompanied by quotes and short essays. Through her images Linda Compton seeks to share the wonder of Nature. She aspires – visually - to enthusiastically tug on your sleeve and say, “Oh wow, look at this!” With her words she hopes to enliven the reader’s sense of wonder and joy by sharing thought-provoking reflections, paradigm-shifting nudges, bits of hard-won wisdom and inspiration. 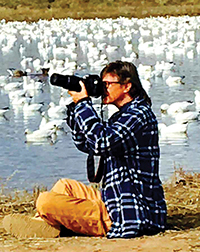 Linda Compton believes that it's never too late to choose joy, despite Life's many betrayals, and that anyone can experience the enlivening beauty of Nature. By observing and applying Nature's Laws, we can discover how to live our Dreams and become our personal best—in mind, body and spirit. Linda is an ordained Presbyterian clergywoman, Nature photographer, joyful entrepreneur and best-selling Amazon author.